Why study Jujitsu at the Kodenkan? If you answer “Yes” to any of these questions, the Kodenkan Jujitsu School is right for you! Are you interested in being able to defend yourself? Do you want to achieve improved discipline and better self-control? Do you want to learn traditional, but effective methods of self defense? Our program teaches straightforward, street-proven techniques of self-protection without the fluff. Our collective teaching experience spans well over 100 years and our no-nonsense approach helps you achieve your needs and objectives. 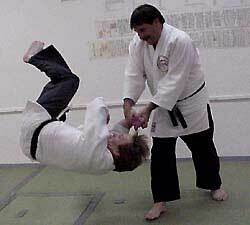 In Danzan-Ryu Jujitsu we incorporate all aspects of what you see in other styles such as Karate, Judo, Aikido, Kempo, etc. This style is based on attack and defense, not sport or competition. Jujitsu is 2000 years old and a combat art, probably one of the most effective in the world. Also, we have the lowest cost with the highest quality of instruction. You can start class any time. We allow visitors any time. We give personal instruction and individual attention.